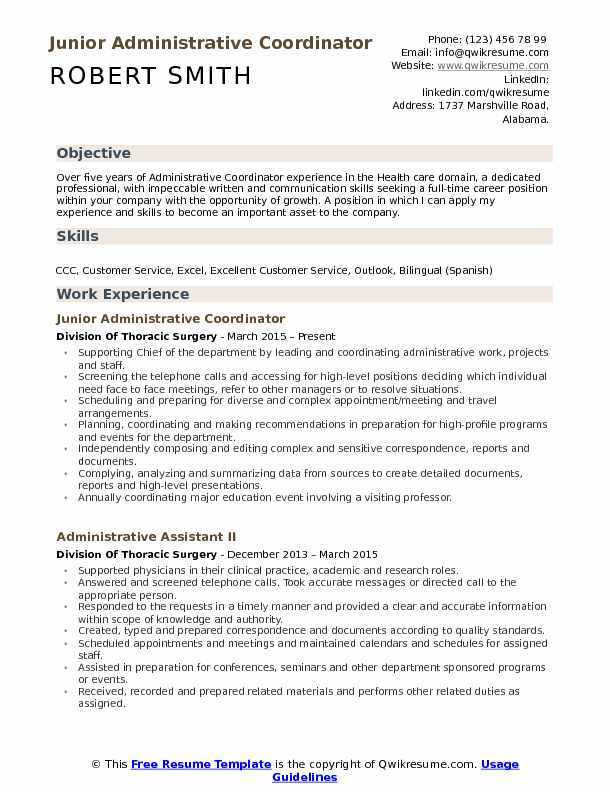 Administrative Coordinator provides administrative duties for the organisation. 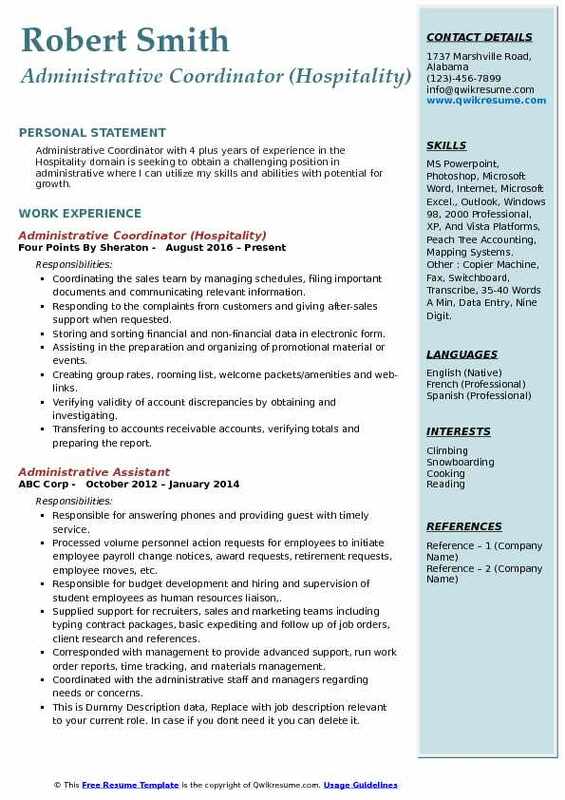 The roles and responsibilities underlined in the job description template are facilitating inquiries or requests, developing project documents like templates, reports, presentation and reference material, providing customer service to all individuals, preparing agenda for office meetings, scheduling conference rooms and monitoring follow ups. 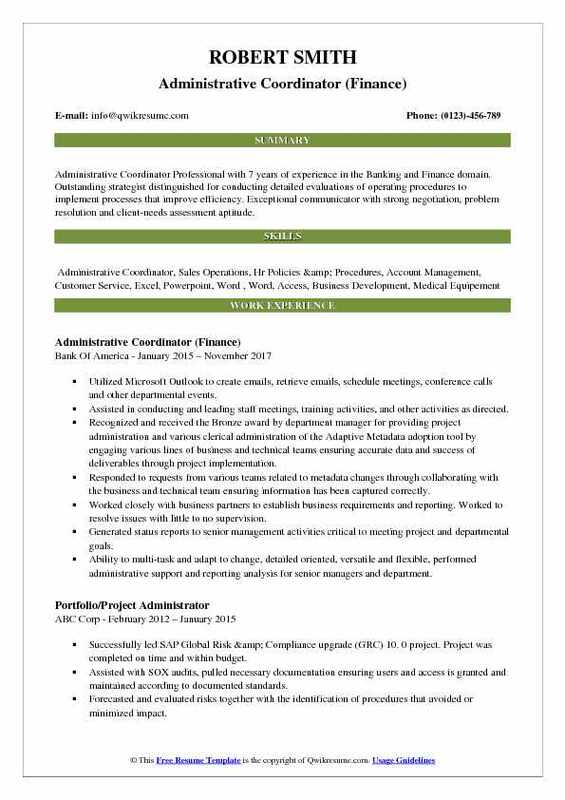 The Administrative Coordinator Resume also highlights duties like coordinating local and regional projects, assisting in office social events, processing vendor invoices, managing administration files, and confidential information discreetly. The skills needed are the individual should be detail oriented, flexible and adaptable to change. He/she should be a team worker with strong knowledge of MS office. He/she should have excellent verbal communication, organisational and time management skills. The educational qualification required is bachelor’s degree or equivalent. Experience in related field is an added advantage. 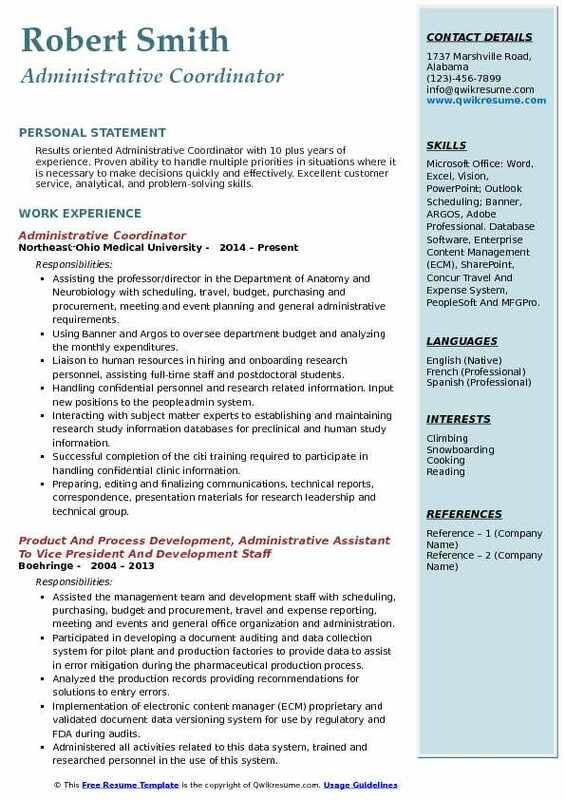 Summary : Administrative Coordinator with over eight years of office coordination experience within the education, rehabilitation and technology industries. Problem solver with an aptitude for complex scheduling and event planning, database management, and report generation. Expertise in: Organization Analytical Thinking Creating Spreadsheets Developing positive relationships with families Interfacing with clients Managing office operations Goal Tracking. Operating as the critical organizational hub of a team of technical recruiters in a high-demand environment. Maintaining all systems and organizational knowledge. Creating a successful company-wide organizational system to improve team communication and enable easier data tracking. Presenting critical weekly research reports on client job openings and trends using Excel. Coordinating local, state, and nationwide travel arrangements including hotel, airfare, and ground. Maintaining the company President multidimensional, complex calendar. Solely responsible for maintaining and growing the company database by over 6000 records. 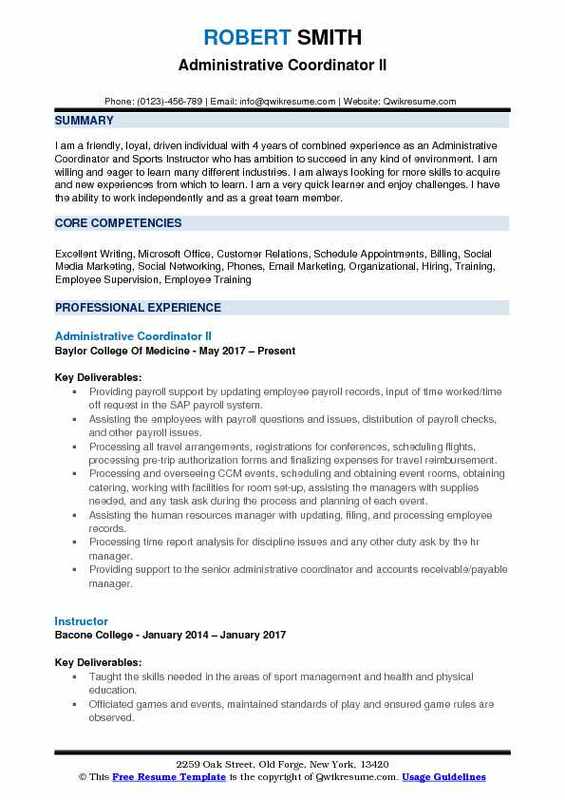 Utilizing exceptional word and editing skills to format and write highly sensitive application materials. Planning all company events and activities, including the annual GDC conference client event. Utilizing social media, the company website, and Mailchimp campaigns to attract talent. Summary : Accomplished and energetic Administrative Coordinator with more than 27 plus years of experience in fast-paced environment. Excellent communication and time management skills. Passionate and motivated with a drive for excellence. Strong organizational and prioritization abilities. 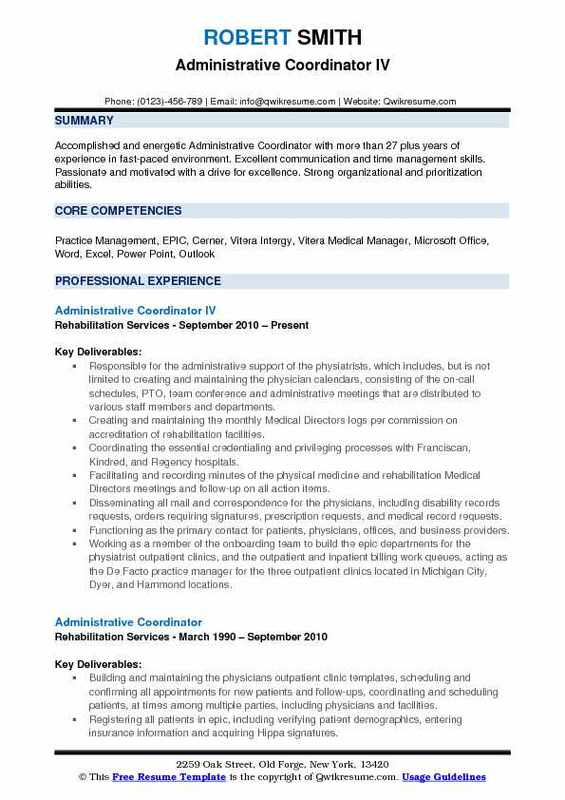 Responsible for the administrative support of the physiatrists, which includes, but is not limited to creating and maintaining the physician calendars, consisting of the on-call schedules, PTO, team conference and administrative meetings that are distributed to various staff members and departments. Creating and maintaining the monthly Medical Directors logs per commission on accreditation of rehabilitation facilities. Coordinating the essential credentialing and privileging processes with Franciscan, Kindred, and Regency hospitals. Facilitating and recording minutes of the physical medicine and rehabilitation Medical Directors meetings and follow-up on all action items. Disseminating all mail and correspondence for the physicians, including disability records requests, orders requiring signatures, prescription requests, and medical record requests. Functioning as the primary contact for patients, physicians, offices, and business providers. Working as a member of the onboarding team to build the epic departments for the physiatrist outpatient clinics, and the outpatient and inpatient billing work queues, acting as the De Facto practice manager for the three outpatient clinics located in Michigan City, Dyer, and Hammond locations. 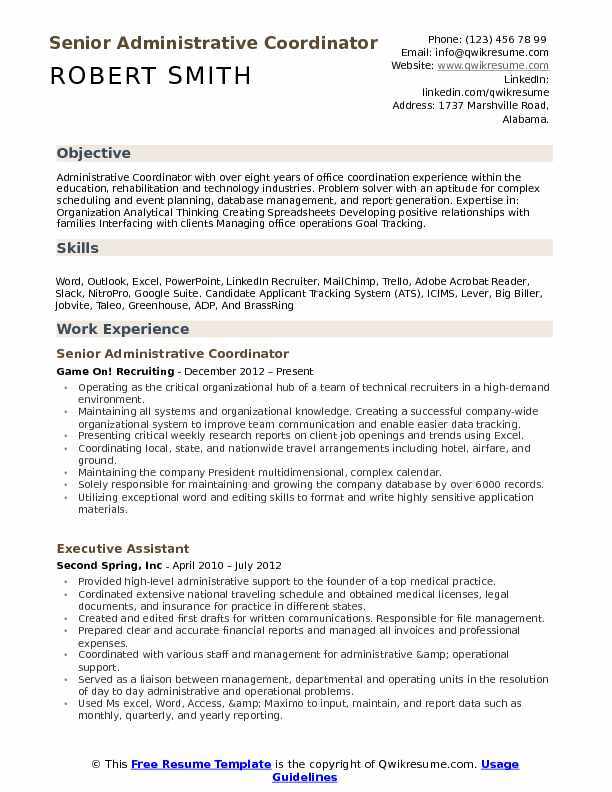 Objective : Administrative Coordinator Professional with 7 years of experience in the Banking and Finance domain. Outstanding strategist distinguished for conducting detailed evaluations of operating procedures to implement processes that improve efficiency. Exceptional communicator with strong negotiation, problem resolution and client-needs assessment aptitude. Utilized Microsoft Outlook to create emails, retrieve emails, schedule meetings, conference calls and other departmental events. Assisted in conducting and leading staff meetings, training activities, and other activities as directed. Recognized and received the Bronze award by department manager for providing project administration and various clerical administration of the Adaptive Metadata adoption tool by engaging various lines of business and technical teams ensuring accurate data and success of deliverables through project implementation. Responded to requests from various teams related to metadata changes through collaborating with the business and technical team ensuring information has been captured correctly. Worked closely with business partners to establish business requirements and reporting. Worked to resolve issues with little to no supervision. Generated status reports to senior management activities critical to meeting project and departmental goals. Ability to multi-task and adapt to change, detailed oriented, versatile and flexible, performed administrative support and reporting analysis for senior managers and department. Set up and coordinated meetings, department events, prepared and disseminated meeting agendas and minutes, created and provided updates to policies and procedures. Created training material, managing departmental hardware inventory. 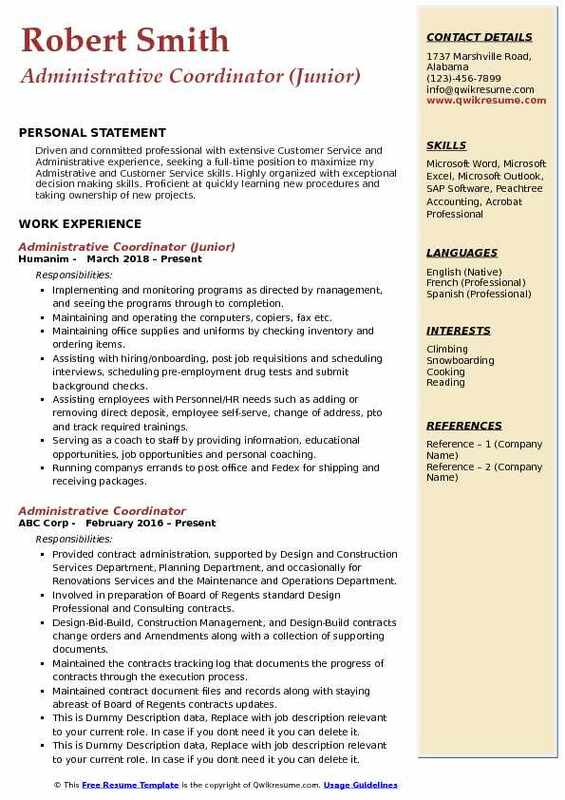 Headline : Administrative Coordinator with 7 years of experience in the HR Services domain looking to obtain a position that is fast-paced and exciting. I hope to be able to use my communication and relationship building skills in this position as well, to work with an outgoing team of professionals. Reviewing students submitted the prerequisite plan and approving coursework, if identifiable, otherwise refer to an advisor. Updating admissions decisions (send the updated letter and updating admissions information in ISIS -decision, folder location, upload pdf of the decision documents, assigning an advisor, update major and GPA, and updating type of decision letter sent). Updating the status changes (provisional to conditional, conditional to fully accept, LOA, inactive, etc. ). Making program changes to student records as requested when approved to transfer programs. Reviewing appeals and provide applicants with the information required for an appeal (personal statement, letters of recommendation, and/or resume). Periodically reviewing information in sis to make sure information is current and accurate (status, advisor, etc. ). Advising applicants and students regarding program specific requirements including admission requirements, degree requirements, GPA, provisional/conditional status, appeals, LOA, extension requests, course offerings, advisor contact information, instructor contact information, etc. Conferring with program chairs and advisors regarding student inquiries, issues or concerns. Alerting the Chairs, Vice Chairs, and Supervisor of any unusual inquiries or issues. Assisting with graduation preparations and participating in the EP Graduation Ceremony. 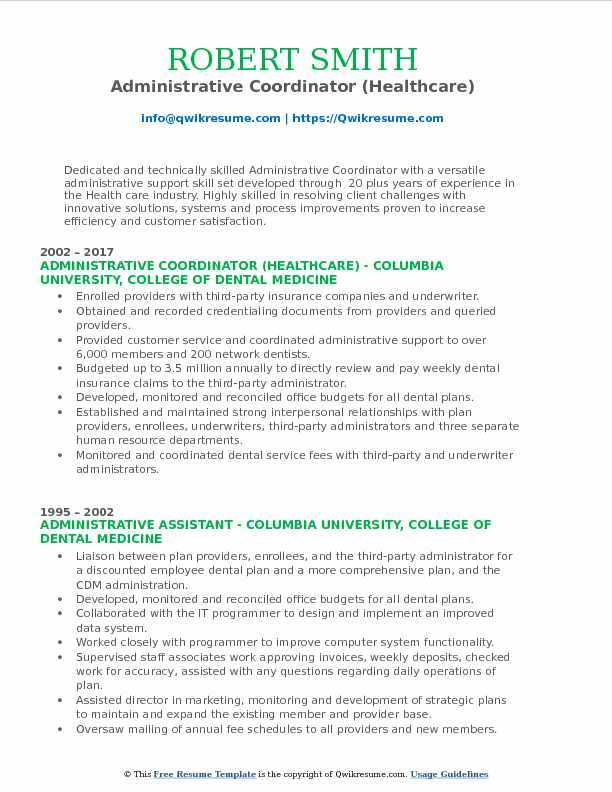 Objective : Administrative Coordinator with 4 plus years of experience in the Hospitality domain is seeking to obtain a challenging position in administrative where I can utilize my skills and abilities with potential for growth. Skills : MS Powerpoint, Photoshop, Microsoft Word, Internet, Microsoft Excel., Outlook, Windows 98, 2000 Professional, XP, And Vista Platforms, Peach Tree Accounting, Mapping Systems. Other : Copier Machine, Fax, Switchboard, Transcribe, 35-40 Words A Min, Data Entry, Nine Digit. Responding to the complaints from customers and giving after-sales support when requested. Storing and sorting financial and non-financial data in electronic form. Assisting in the preparation and organizing of promotional material or events. Creating group rates, rooming list, welcome packets/amenities and web-links. Verifying validity of account discrepancies by obtaining and investigating. Transfering to accounts receivable accounts, verifying totals and preparing the report. Summary : Administrative Coordinator with 24 years of experience is seeking a challenging position with an opportunity for growth. Providing administrative support to the director of sales for IOWA/Nebraska and acting as the office manager for the Urbandale business office. Worked as project manager for US cellular IOWA State Fair Committee (2013-2016). Leading the development of US Cellular IOWA state fair and territory SharePoint sites. Leading an internal, enterprise project that allowed non-retail sales associates to help at our retail stores during key shopping dates for the holidays. The main role was developing a Sharepoint site that automated the signup process for shifts, real-time reporting and central location for details on the program and administration. Also, responsible for the communication strategy and implementation. Ensuring deadlines are met by sales and store leaders for various training and operational requirements. Creating and distributing reports to help track individual and team performance. Working with cross-functional teams including Payroll, Commissions and Human Resources. Planning and organize territory level team meetings, team builders and training (onsite and offsite): venue selection, negotiating terms of the event, audio/visual, refreshments, catering and all arrangements required. Managing calendar and schedule associate/leader one-on-ones, conference calls and webinars. Managing all travel arrangements and coordinate pre-planning of trips. Providing leadership and guidance to the IOWA/Nebraska retail administrative coordinators. Summary : Dedicated and technically skilled Administrative Coordinator with a versatile administrative support skill set developed through 20 plus years of experience in the Health care industry. Highly skilled in resolving client challenges with innovative solutions, systems and process improvements proven to increase efficiency and customer satisfaction. Enrolled providers with third-party insurance companies and underwriter. Obtained and recorded credentialing documents from providers and queried providers. Provided customer service and coordinated administrative support to over 6,000 members and 200 network dentists. Budgeted up to 3.5 million annually to directly review and pay weekly dental insurance claims to the third-party administrator. Developed, monitored and reconciled office budgets for all dental plans. Established and maintained strong interpersonal relationships with plan providers, enrollees, underwriters, third-party administrators and three separate human resource departments. Monitored and coordinated dental service fees with third-party and underwriter administrators. Prepared presentations for employees and students describing various dental plans. Administered and supervised student dental plans in clinic and faculty sites while answering benefit questions for students and worked with the student health offices administration. Wrote plan descriptions for the provider booklet, and wrote and edited correspondence and flyers, as required. 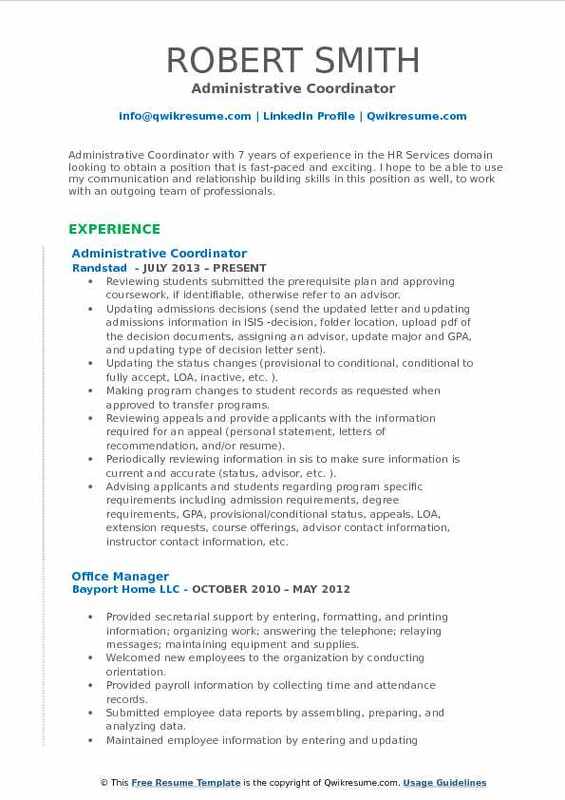 Summary : An ambitious Administrative Coordinator driven to advance career as an administrative support. Focused on providing an optimal level of administrative, analytical, & customer service skills to maximize the efficiency of the institution. Directly responsible for the effective operations of two (2) ancillary units. Supporting Ad hoc administrative requests (i. e. Booking/coordinating lunches, meeting rooms, other duties as assigned). Responsible for coordinating training sessions for new resources entering the system (i.e. Arranging access and scheduling training for tools). Working closely with teams of nurses, doctors, and administrative officials to ensure prompt attention to customers and physicians needs. Assisting in hiring, training, coaching, and discipline of clinical team members. Responsible for the efficient auditing and reconciliations of department charges for proper processing and billing. Assisting with team building initiatives and overall support for maintenance of organizational culture and employee morale. Maintaining the confidentiality by practicing and being compliant with HIPAA regulations. Meeting and conferring with other governmental and/or local agencies to implement programs, involving community groups and determine needs, expectations, and effectiveness. Objective : Driven and committed professional with extensive Customer Service and Administrative experience, seeking a full-time position to maximize my Admistrative and Customer Service skills. Highly organized with exceptional decision making skills. Proficient at quickly learning new procedures and taking ownership of new projects. Implementing and monitoring programs as directed by management, and seeing the programs through to completion. Maintaining and operating the computers, copiers, fax etc. Maintaining office supplies and uniforms by checking inventory and ordering items. Assisting with hiring/onboarding, post job requisitions and scheduling interviews, scheduling pre-employment drug tests and submit background checks. Assisting employees with Personnel/HR needs such as adding or removing direct deposit, employee self-serve, change of address, pto and track required trainings. Serving as a coach to staff by providing information, educational opportunities, job opportunities and personal coaching. Running companys errands to post office and Fedex for shipping and receiving packages. Processing invoices for payment, making cash and check bank deposits, assisting with AP and AR and travel arrangements. Scheduling and coordinating meetings, events, appointments and travel arrangements for managers and crews. 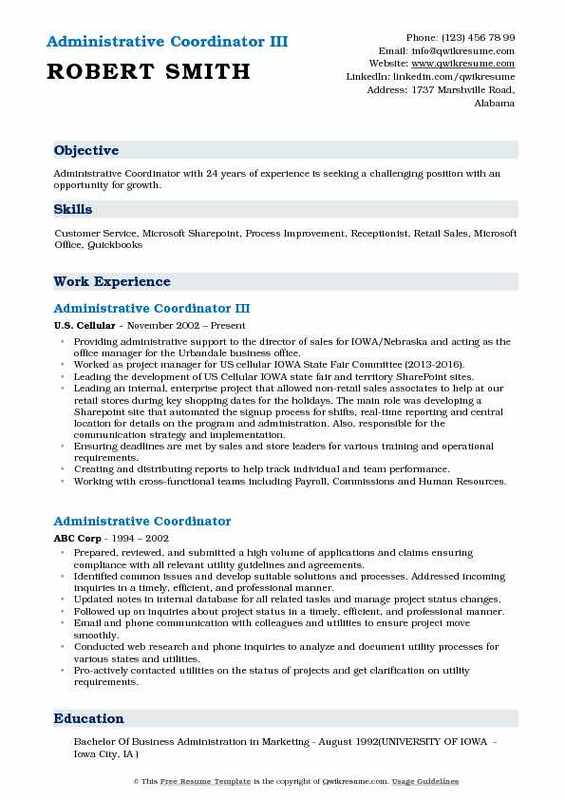 Objective : I am a highly skilled Administrative Coordinator 3 plus years of experience, with a strong background in successful business management strategies and innovative operational solutions. In addition, with exceptional customer support capabilities, I can offer a level of versatility that can make a real difference to your company bottom line. Providing administrative support to the Vice Provost of undergraduate admissions and financial aid. Responsible for the execution and completion of special projects and assignments, to include maintaining schedules, preparing and producing presentation materials for meetings, preparing and maintaining confidential reports and presentations. Establishing and maintaining complex Vice Provost calendar and coordinating related meeting materials and logistics. Scheduling international and domestic speaking engagements and conferences, appointments, external meetings and events. Liaison with provosts office, presidents office and board of trustees office on high level confidential projects, presentations, materials and applicants. Managing VIP applicants and prospects; track, research and collect applicant data analysis for related departmental and university wide meetings. Processing travel and expense reimbursements and purchasing transactions through sap and relevant jhu systems. Creating Excel and powerpoint presentations for board of trustee and departmental meetings. Responsible for the maintenance of office equipment and supplies, liaison with facilities regarding maintenance issues and repairs, liaison with internal departments and external vendors regarding office equipment repairs. Coordinating the development of general funds and budget projects and proposals with the vice provost of undergraduate admissions and financial aid, assistant Vice Provost of financial aid, and dean of undergraduate admissions for compilation of fiscal year proposals, requests for review, and approvals. 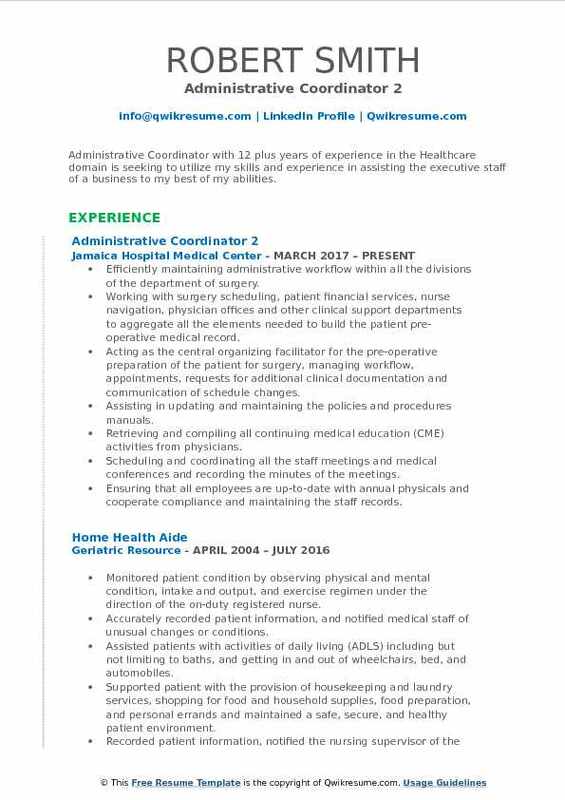 Headline : Over five years of Administrative Coordinator experience in the Health care domain, a dedicated professional, with impeccable written and communication skills seeking a full-time career position within your company with the opportunity of growth. A position in which I can apply my experience and skills to become an important asset to the company. Supporting Chief of the department by leading and coordinating administrative work, projects and staff. Screening the telephone calls and accessing for high-level positions deciding which individual need face to face meetings, refer to other managers or to resolve situations. Scheduling and preparing for diverse and complex appointment/meeting and travel arrangements. Planning, coordinating and making recommendations in preparation for high-profile programs and events for the department. Independently composing and editing complex and sensitive correspondence, reports and documents. Complying, analyzing and summarizing data from sources to create detailed documents, reports and high-level presentations. Annually coordinating major education event involving a visiting professor. Checking out and scheduling multiple appointments after visits per doctors request. Prior authorizations for medication request/obtain insurance approval for non-coverage -medications. Pre-certification approval for radiology/obtain approval for exam such as MRI, CT Scan etc. ,. 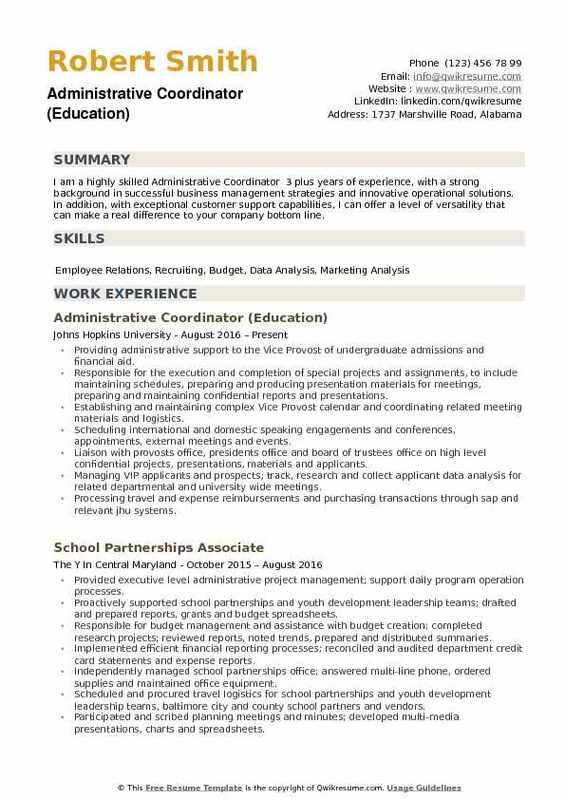 Objective : I am a friendly, loyal, driven individual with 4 years of combined experience as an Administrative Coordinator and Sports Instructor who has ambition to succeed in any kind of environment. I am willing and eager to learn many different industries. I am always looking for more skills to acquire and new experiences from which to learn. I am a very quick learner and enjoy challenges. I have the ability to work independently and as a great team member. Providing payroll support by updating employee payroll records, input of time worked/time off request in the SAP payroll system. Assisting the employees with payroll questions and issues, distribution of payroll checks, and other payroll issues. Processing all travel arrangements, registrations for conferences, scheduling flights, processing pre-trip authorization forms and finalizing expenses for travel reimbursement. Processing and overseeing CCM events, scheduling and obtaining event rooms, obtaining catering, working with facilities for room set-up, assisting the managers with supplies needed, and any task ask during the process and planning of each event. Assisting the human resources manager with updating, filing, and processing employee records. Processing time report analysis for discipline issues and any other duty ask by the hr manager. Providing support to the senior administrative coordinator and accounts receivable/payable manager. Coordinating the reports and allocations of accounts within the department as needed. Summary : Administrative Coordinator is seeking to obtain the position where I can apply my education and over 9 years of experience in higher education. A strong commitment to providing exceptional customer service. Able and eager to adapt quickly to new situations and technologies. Upholds positive attitude and sense of humor through stressful situations. Processing new employee paperwork including substance abuse and background security checks. Maintaining multiple databases, coordinating the scholarship program and faculty awards. 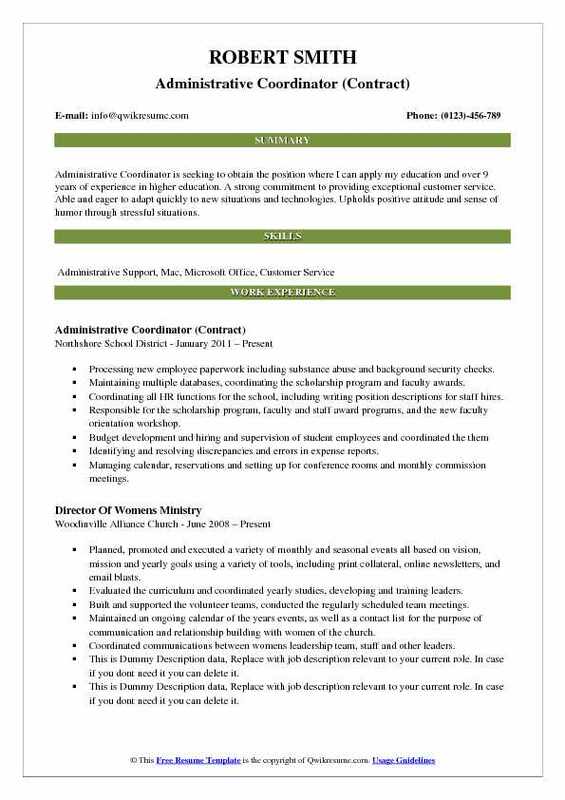 Coordinating all HR functions for the school, including writing position descriptions for staff hires. Responsible for the scholarship program, faculty and staff award programs, and the new faculty orientation workshop. Identifying and resolving discrepancies and errors in expense reports. Managing calendar, reservations and setting up for conference rooms and monthly commission meetings. Maintaining discretion when dealing with sensitive and confidential information. Planning, directing, coordinating, and supervising the operations of a 14 member staff. Ensuring that they follow policies, procedures and safety guidelines. Summary : Administrative Coordinator with 12 plus years of experience in the Healthcare domain is seeking to utilize my skills and experience in assisting the executive staff of a business to my best of my abilities. Efficiently maintaining administrative workflow within all the divisions of the department of surgery. Working with surgery scheduling, patient financial services, nurse navigation, physician offices and other clinical support departments to aggregate all the elements needed to build the patient pre-operative medical record. Acting as the central organizing facilitator for the pre-operative preparation of the patient for surgery, managing workflow, appointments, requests for additional clinical documentation and communication of schedule changes. Assisting in updating and maintaining the policies and procedures manuals. Retrieving and compiling all continuing medical education (CME) activities from physicians. Scheduling and coordinating all the staff meetings and medical conferences and recording the minutes of the meetings. Ensuring that all employees are up-to-date with annual physicals and cooperate compliance and maintaining the staff records. Supervising staff attendance and punctuality usiKronosnos software, generating reports to assist with payroll. Monitoring inventory and order office supplies and interacting with department staff in a positive and facilitative manner. 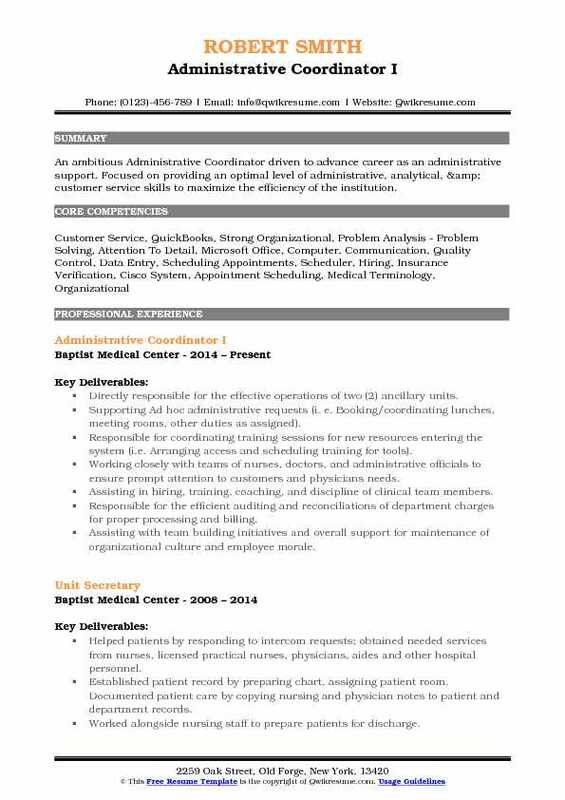 Summary : Results oriented Administrative Coordinator with 10 plus years of experience. Proven ability to handle multiple priorities in situations where it is necessary to make decisions quickly and effectively. Excellent customer service, analytical, and problem-solving skills. Skills : Microsoft Office: Word, Excel, Vision, PowerPoint; Outlook Scheduling; Banner, ARGOS, Adobe Professional. Database Software, Enterprise Content Management (ECM), SharePoint, Concur Travel And Expense System, PeopleSoft And MFGPro. Assisting the professor/director in the Department of Anatomy and Neurobiology with scheduling, travel, budget, purchasing and procurement, meeting and event planning and general administrative requirements. Using Banner and Argos to oversee department budget and analyzing the monthly expenditures. Liaison to human resources in hiring and onboarding research personnel, assisting full-time staff and postdoctoral students. Handling confidential personnel and research related information. Input new positions to the peopleadmin system. Interacting with subject matter experts to establishing and maintaining research study information databases for preclinical and human study information. Successful completion of the citi training required to participate in handling confidential clinic information. Preparing, editing and finalizing communications, technical reports, correspondence, presentation materials for research leadership and technical group. Participating in the preparation of grant materials for national institute of health and various other submissions. Liaison between grants office and research group.